Government misses congestion targets | What Car? Motorists are wasting more time sitting in queues on 100 key routes because the Government has failed to meet targets for reducing congestion. Ministers promised to make journeys more reliable on the key motorway and A-road routes three years ago, but a report by The Times newspaper has revealed that delays have grown. Furthermore, The Times reports the Department for Transport attempted to bury its failure to cut congestion on the routes by releasing the figures in a large batch of reports on congestion. The failure is particularly embarrassing for ministers because the target of reducing the waiting time on the slowest 10% of journeys was criticised for being unambitious when it was announced in 2005. The average driver was delayed by 3mins 47secs for every 10 miles travelled on the slowest 10%of trips in 2005. Figures for the last 12-month period, ending on March 31, show that the average delay had risen by 4.4% to 3mins 57 secs. The worst delays were on the A556, the M26; the A453 from Kegworth to Nottingham; the M25; the M60; and the M1 from junction 13 to 6a. 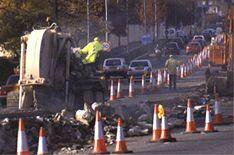 A spokeswoman for the Highways Agency said that it had failed to predict the impact of long-running roadworks, such as the widening of the M1, and that the widespread flooding of last summer had caused further problems.